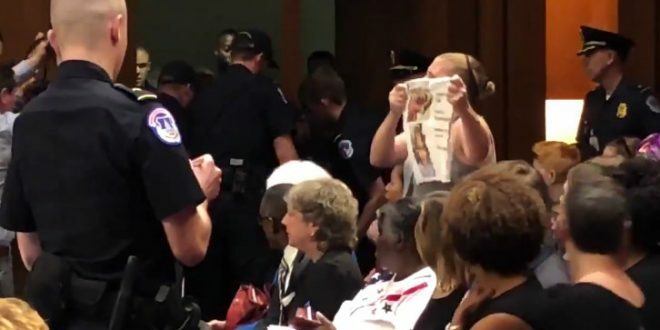 Protesters Disrupt Start To Kavanaugh Hearing [VIDEO] - Joe.My.God. This hearing is off to a turbulent start. Democrats interrupted Chairman Chuck Grassley, a Republican of Iowa, the moment he started his opening statement. They’re demanding a delay in the hearing until more documents are released and there is more time to review the documents that have been released. The first request came from Senator Kamala Harris, a Democrat of California. Senator Richard Blumenthal, a Democrat of Connecticut, then asked for the meeting to be postponed. The small gallery of observers erupted in applause. And then several women began shouting “Vote no on Kavanaugh”.